MedWise Insurance Advocacy — Your Medical Healthcare Advocate – Gets Results. Adria is amazing! With one 20-minute phone call she saved us a couple thousand dollars. She also helped me make sure that my Dad had the absolute best care without being overcharged in anyway. She saved our family over $10,000 in costs related to transportation, assisted living and skilled nursing facilities. Not to mention she saved dozens of hours in learning the system that is designed for time pressured regular people to not learn. She is absolutely amazing and super effective. You simply can't learn what she knows or be as effective to her. I highly recommend her working with you. My name is Bianey Paramo and I would just like to take the time to say how thankful my family and I are to Adria Gross for helping us resolve a very big hospital bill above $23,000. I have four children and my husband is the only one who works and it worried us on how we were going to pay the amount. I thank God for meeting Adria Gross and all of her hard work in turning $23,000 to just $600. I hope God sends her many blessings and helps her to keep helping people that are in the same situation we were in, because without her we wouldn't have solved this problem. You are just AMAZING a total angel... thank you, thank you, thank you!!!! I was recently saddled with almost $4000 in medical bills unexpectedly. What was incredibly frustrating is that I seemed unable to make any headway into solving the issue between the provider and my insurance company. I decided there must be such a thing as a medical advocate and immediately started an internet search to see if I could locate such a service. I found a few sites, but it was only Adria Gross's that made me feel comfortable about making the call. After scrolling through pages of solid testimonials on her site, I felt confident that if anyone could help me, it would be Adria! I was right! In less than 10 days, Adria had cut through all the levels of bureaucracy to find the exact right department to present the case. Not only did she present the case, but when the insurance company was unwilling to pay the claim Adria argued the case and requested to go up even higher. Soon after that the case was settled, with the insurance company paying 100% of my bill. I should also mention that throughout the process, Adria stayed in constant contact with me via email and phone. Adria gross is tops in my book, as well as in my pocket book! I have already referred her to a colleague and will continue to refer her, and her wonderful service, to everyone I know. 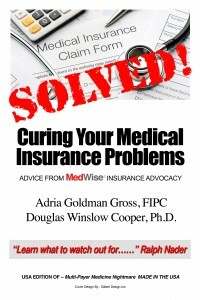 I contacted Adria Gross of Medwise Billing, in January 2014. During this time I had been without health insurance and had just received treatment at a local medical group for a routine Colles fracture of the wrist. Upon receipt of my final medical bills for 2 doctors visits and 2 xrays I was astounded at the cost and realized that I had been billed way and above the ordinary and customary charges that a patient with insurance would have been required to pay. Adria Gross was immediately responsive to my pleas for help. She was well connected with people in high places and well informed as to how to dismantle the brick wall of my medical groups billing agency. Moreover she was willing to go the extra mile for my case and charge me a very reasonable amount for her services after the negotiations were successful. I am very pleased to recommend Adria Gross and Medwise Billing to anyone who has been victimized by our current medical billing system and doesnt have an insurance company to dispute unfair charges. She cares about the man on the street and is a powerful resource against corruption in medicine. Last year, my daughter was hospitalized with a mental breakdown in the psychiatric ward for about ten days, and then was treated as an outpatient at the hospital for a period following. On the traumatic Thursday that I placed her on an involuntary hold at the hospital, I realized that she would turn 24 years old on the upcoming Sunday, and her insurance as a family member under my insurance plan would end. So I had to scramble all day that Friday to get the insurance company to confirm that she would be covered under a pre-existing condition for her hospital stay. At the end of the day I had barely managed to be successful, and knew that my daughter could stay in the hospital without major financial damage. hospital to go to collections. I now know just how stressful it is to be worried sick about a family member, and providing care, holding down a job, while at the same time, having to deal with the confusing and byzantine world of health insurance coverage. A friend of mine recommended that I try to find a "health care consultant". I didn't even know that there were such people. After a search, I found Adria at MedWise. Adria, quite simply, came to my rescue. She was warm and friendly and caring, and immediately put my mind at ease by explaining what she would be able to do. Adria was available anytime I needed to get in touch with her. I sent her all my notes and paperwork, and she immediately got to work on my behalf. The stress of dealing with the bills was taken off my plate, and I immediately felt better. Not only did Adria help with my daughter’s hospital bill, she was also able to reduce or have dismissed several other doctor and therapy bills that insurance was refusing to cover. Adria has a stellar knowledge of the health insurance industry, and she gets results. At the end of her work on my behalf, she was able to save me a total of $13,370! It was well worth the reasonable rates she charged. I could never have been able to get the same results on my own. I wish that everyone knew about Adria and her work. I can't recommend Adria highly enough. It is exceedingly difficult to be a advocate for yourself in health insurance billing, and Adria's expert advice is invaluable. If you are faced with the byzantine world of medical bills, contact Adria NOW. She not only saved us thousands of dollars in medical expenses, she gave us that most wonderful of gifts: peace of mind. Her fees are amazingly reasonable, and she is also a delight to work with. She will work ferociously on your behalf with insurance companies, hospitals and doctors. I will never deal with another large medical expense again without hiring Adria first! Thanks for all you do!! As I was seeking assistance with care regarding insurance issues and medical cost negotiations if this were to become necessary, I turned to the internet. I found Medwise Insurance Advocacy, Inc. and was immediately impressed. It was everything I was looking for when I started my search. I called the number immediately and Adria Gross the owner answered her phone and listened to the problems I had been encountering with the insurance company and phone calls due to claims not being paid. She was very empathetic and immediately took a valued interest in the issues shared. I knew that minute I would hire her to assist with my insurance issues. I sent the necessary information to help Adria’s company to assist me with my bills, and insurance information. Once the information sent was reviewed, I received a phone call from Adria which lasted four hours. Together we called all of the relevant hospitals, clinics, and various small physician groups. We then called the insurance company and found the information sent to them had been enough to reverse their denial of coverage due to a pre-existing clause and the claims will be paid as of February 1, 2014. After hearing the information I was still unclear to the meaning shared by the customer service representative. Having Adria on the phone with me to explain the information was invaluable. Adria has been a godsend to me as I have attempted to traverse through the difficult challenges of the insurance company and medical facilities requiring payment. It is obvious Adria truly has a heart for those families and individuals who are denied coverage and then get the run around from insurance companies. She also has the gracious spirit to help others. I have the utmost confidence in and admiration for Adria. In this day and time it is rare to find one who is more dedicated and motivated toward serving others. "We received a medical bill for over $3000 for an MRI that should have been covered by insurance. Insurance denied the claim, and we ran into multiple roadblocks with both the provider and the insurance company. Adria Gross with MedWise was able to walk us through the appeal process and help guide us through the otherwise confusing insurance process. What a relief it was to get a letter from the insurance company stating that the appeal had been approved and they would pay our claim in full! I would highly recommend Adria for anyone needing assistance dealing with health insurance claims. Great service and very responsive. Thanks Adria." If a medical insurance corporation is stone-walling your claim, don't argue with them-- go see Adria Gross. Adria is not merely a top professional, she practically invented her profession. She is a passionate and empathic defender of the rights of her clients. She treats her clients like human beings and pays attention to their stories. She says that every case is different--I am sure that she devises a different strategy for every case. She certainly has a lot of strategies. She has spent years studying the system. She has a profound knowledge of the way medical insurance corporations work (or don't work) and she is familiar with both the legal and the financial aspects of each case. She stays on top of current developments. We went to her because we were trying unsuccessfully to collect reimbursement for an emergency hospitalization that occured in a foreign country. (It was clearly covered by our policy.) There was a lot of money at stake and there seemed to be no hope of ever seeing it again. But when Adria got to work, the stone wall began to crumble. In the end, after months of stalling tactics, they finally ponied up the full amount. There's no way we could have recuperated the money if Adria had not intervened. She moves mountains! Surgery is terrifying enough; the endless insurance hassles waiting on the other side are mind-boggling. After a year of making every effort to resolve an exorbitant and unreasonable surgical fee, I was fortunate enough to find Adria Gross. She was the first person who was able to make sense of the system for me. In addition to resolving my billing problems, she shared my outrage at the unfair bills that were arriving on my doorstep. For the first time in a year, I felt like I had someone on my side. Adria is knowledgeable and caring, and I can't recommend her highly enough. If you are looking for a medical insurance advocate, I can highly recommend Ms. Gross. She is a force of nature! She reviewed our all of our information rapidly and was able to cut to the heart of it all in two sentences. Adria reduced our bill from $6,300 to $190 within a couple days. She was very direct and professional in her communications with us and everyone she contacted on our behalf. In one 30 minute phone consultation, Adria was able to help me settle an issue I had been battling for 5 months and was able to reduce my bill by $1,100. Thanks Adria!! Adria enjoys being a medical bill advocate and I believe this is the key to her outstanding success. Adria depends on years of experience to get heard by the right person and keeps persisting until she gets the answers she needs. She knows where to push to get money back finding errors in the bills you have been presented. She knows how to appeal to the bill collector's human side and helps them to understand what you can afford. She understands the personality of the people she needs to deal with and can speak their language making it easier for them to help your family. On top of everything, she takes time to chat with you about your life and listens. She also shares heartbreaking and heartwarming stories of other families in similar situations with you. She is a fantastic storyteller and it is a privilege to listen to her life accomplishments and experience.